Sweden is among the nations worldwide that devote the most money to research relative to its population. Sweden's expenditures for R&D is total 3.26% of GDP. The business sector accounts for around 70 percent and the higher education sector for 27% of this spending. Companies largely fund their own research, but receive some contributions from the government and abroad. The public sector finances R&D through grants paid directly to higher education institutions (HEIs) and through support for research councils and sectoral research agencies. In addition, several research foundations have been started with public funds, providing research funding in excess of SEK 1.2 billion annually. The Swedish Parliament grants R&D funds in all of the ministries' spheres of responsibility. The Minister for Higher Education and Research is responsible for overall coordination of research policy in the Government Offices. By far the greatest share of publicly funded research in Sweden is conducted in HEIs. Research institutes account for only a small share, which distinguishes Sweden by international comparison. The Swedish Research Barometer, the Swedish research system in international comparison. The Swedish Higher Education Authority. Information about Higher Education Institutions in Sweden and a list of university colleges, universities and independent higher education providers. Swedish Government, information about education and research in Sweden. Vinnova is a Swedish government agency working under the Ministry of Enterprise and Innovation and acts as the national contact agency for the EU Framework Programme for R&D. Vinnova is also the Swedish government’s expert agency within the field of innovation policy. Vinnova’s vision for Sweden is to be a world-leading country in research and innovation, an attractive place in which to invest and conduct business. We stimulate collaborations between companies, universities and other higher education institutions, public services, civil society and other actors. Our activities also focus on strengthening international cooperation. Each year, Vinnova invests around SEK 3 billion in fostering innovation. Most of these funds are allocated via calls for proposals in which companies, public sector actors and other organisations apply for funding. All investments are continuously monitored and evaluated and we regularly analyse the impacts of our investments. The Swedish Research Council is a government agency under the authority of the Ministry of Education and Research. Formas, the Swedish research council for sustainable development, promotes and supports research within the areas Environment, Agricultural Sciences and Spatial Planning. The research comprises basic research, need-driven research and innovation. The international activities of Formas are intended to contribute to knowledge development of high scientific quality and relevance to sustainable development. Sustainable development is a mutual international challenge and the UN sustainable development goals set defined requirements for increased international partnerships, not least in the areas of knowledge acquisition and dissemination. We live in a world of increasing globalization, where competition for skills, creativity and capital is becoming successively tougher. This creates both opportunities and challenges for a relatively small country such as Sweden that has a reputation for having a strong knowledge-base. Active international research collaborations are therefore essential in ensuring access to global knowledge, to promote Swedish innovative skills and competitiveness, and to contribute to sustainable development. Forte is a research council and a government agency under the Swedish Ministry of Health and Social Affairs. Every year, Forte distributes around SEK 550 million to both basic and needs-driven research. This ranges from individual project grants to larger efforts to build world-class research environments. Forte’s tasks also include identifying areas where more research is needed, evaluating and analysing research results and making them accessible for all. 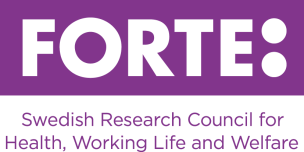 Forte funds research within three main fields: health, working life and welfare. This includes research in a number of areas that deal with different aspects of people’s lives, for example: work and health, work organisation, labour market, public health, social services and social relations, care sciences, Children and young people, ageing and health, international migration and ethnical relations (IMER) and alcohol, narcotics, doping, tobacco and gambling (ANDTG). Forte’s fields of research include important societal issues from both a European and global perspective. This is why we collaborate with organisations in many other countries. Together, we issue joint calls for proposals and launch international research initiatives. Forte is part of the Swedish organisation in the European Union framework program for research and innovation, Horizon 2020. Riksbankens Jubileumsfond, RJ, the Bank of Sweden Tercentenary Foundation which mainly finances research in the humanities, theology,social sciences and law. the Knut and Alice Wallenberg Foundation, which provides substantial funding for scientific equipment in particular. the Swedish Cancer Society is an independent non-profit organisation that raise and distribute money for cancer research. the Swedish Heart-Lung Foundation is a charitable fundraising organisation that distributes money to heart, lung and vascular research. Kungliga Vetenskapsakademien, KVA, the Royal Swedish Academy of Sciences. Kungliga Ingenjörsvetenskapsakademien, IVA, the Royal Swedish Academy of Engineering Sciences. Generally researchers submit their applications to the respective Swedish funding agencies on their own. Applications should normally be approved / signed by a Head of Department. Read more below what applies for the different funding agencies and about current open calls. Grants are normally awarded for several types of activities, such as projects grants, junior researcher grants, postdoc grants, visiting professors, workshops, etc. Each funding agency specifies which grants will be available. Forte, Formas and the Swedish Research Council use a common application system, Prisma, for the applications. For applications in Prisma you must be employed by an approved administrating organisation in Sweden during the grant period. Who is an approved organisation will be shown in Prisma and further information is available on the respective funding agency’s web page. 1. Vinnova, Sweden's government agency for innovation. Our mission is to contribute to sustainable growth by improving the conditions for innovation. We do this mainly by funding innovation projects and the research needed to develop new solutions. We also invest long term in strong research and innovation environments. We stimulate collaborations between companies, universities and other higher education institutions, public services, civil society and other actors. Our activities also focus on strengthening international cooperation. On the web page www.vinnova.se/en/apply-for-funding you will find information how to apply, find the right funding and rules for funding. Our research grants are open for all applicants. Some grants are open for researchers in all fields, others are linked to a specific area of science. All grants are regularly announced on the web site: www.vr.se . The web site provides instructions for applying as well as forms, contacts and the Research Council’s general terms and conditions. There are a few grants that more specifically promote mobility or international cooperation. This grant is part of a programme to enable long term planning and secure prominent researchers the conditions to focus on their research. The Council plans to launch this grant every two years. The Swedish Research Council's calls on visiting professorships are: Kerstin Hesselgren Visiting Professorship; Olof Palme Visiting Professorship; and Tage Erlander Visiting Professorship. The purpose of the visiting professorships is to enrich and develop the work of Swedish University departments in a manner that benefits the department's own activities, and can lead to continued international cooperation. The purpose of the Swedish Research Links programme is to support the development of long-term research partnerships between Swedish researchers and researchers within low income and lower middle-income countries. The program is open to researchers from all academic disciplines, covering theoretical as well as empirical, basic as well as applied fields of research. The countries eligible for these forms of collaborative research are on the OECD/DAC list (columns Least Developed Countries, Other Low Income Countries and Lower Middle Income Countries and Territories). The Joint Committee for Nordic Research Councils for the Humanities and the Social Sciences (NOS-HS) invites proposals for funding series of Nordic workshops. The aim of the grant is to promote research collaboration and development of new research areas and programmes within the humanities and social sciences in the Nordic countries. The Graduate Research Opportunities Worldwide (GROW) enables NSF Graduate Research Fellows to gain international research experience and establish collaborations with counterparts at Swedish university departments, by working in Sweden for a shorter period of time. This grant is the result of cooperation between the American National Science Foundation and the Swedish Research Council. Forte spends about 550 million SEK (approx. 58.3 million Euros) yearly on research funding. At present, Forte provides no funding opportunities specifically dedicated to incoming research fellows. However, researchers who hold a Ph.D. and are affiliated with a Swedish university, higher education institute (HEI) or at another research organisation that has been approved as an administrating organisation by Forte, are eligible to apply for funding in Forte´s regular calls. Forte’s annual open call for proposals opens in December every year, and welcomes applications within Forte’s overall responsibilities of health, working life and welfare. The application process is divided into two stages, with submission of project outlines in December–January and full applications in April–May. Project grants provide funding for individual research projects and are awarded for a maximum of 3 years. The grant is open to researchers with a minimum requirement of a PhD. Junior researcher grants are awarded for 4 years and can be granted up to 6 years after PhD defence. The aim of this grant is to support early stage researchers. The grant should cover at least 40 % of the salary for a junior researcher. Postdoc grants are targeted at researchers in the beginning of their careers. The grants provide researchers the opportunity to continue their research career after obtaining their PhD. The grant can be applied for up to 2 years after doctoral examination. The grant is awarded for 2 years and corresponds to a full-time salary. Forte also makes thematic calls for proposals in response to identified needs in the society and the government´s intentions. Some of the thematic calls are joint initiatives with other countries and are intended for international research collaborations. See all open calls for proposals at https://forte.se/en/latest/funding.